Crumpets are NOT English Muffins, Okay? Let’s get that much straight. 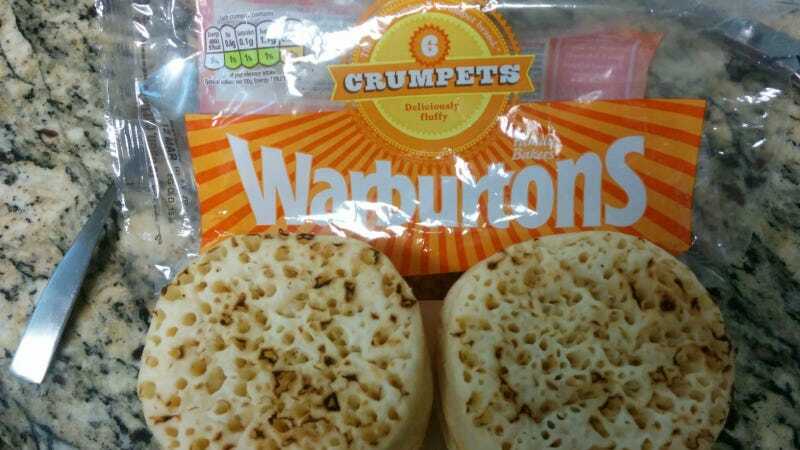 A certain Oppo, who shall remain nameless, and who likes his brekkies, went to extreme lengths to disabuse me of the notion that English muffins were really the same thing as crumpets. Nope. This Oppo mailed me some crumpets from northern England, and they did not disappoint. Crumpets are thicker than E. muffins, and fluffier and cakey, and crumpets lack the sourdough edge and dryness of an E. muffin. More fat in the crumpet and the bubbles form vertical cavities in the baked crumpet. From the looks of the bottom, it looks almost as if the crumpet were fried. The oil that’s inherent in the crumpet makes it toast up very nicely. Add some salted dairy butter and BAM! Now, this Oppo was not content with mailing me crumpets alone. He also included your basic Fort Knox of chocolate. There was another bar, but I sent it with Mrs. O.C., who is on her way to the bridal shower for our betrothed daughter.